a small loss: Tri me! I ended up passing the Ironman lengths for both running and swimming, but only got about half of the biking done. And some people do this in one day! Holy mackarel. I would like to do a triathlon one day, I think. I definitely need to get better at swimming before I do it! 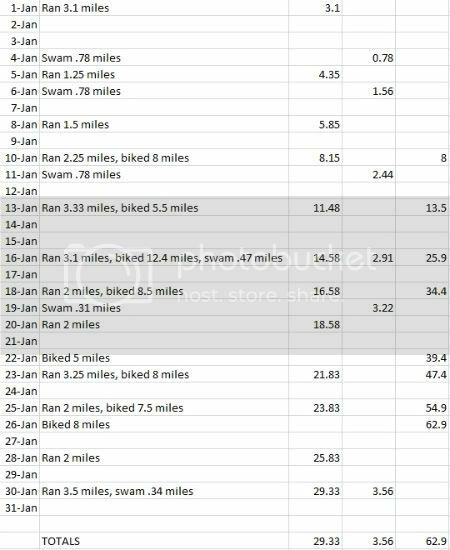 It's interesting, because in general I don't like tracking - I tend to get obsessive over numbers - but I really enjoyed marking my runs, rides, and swims down. I liked being able to look back at the end of the month and see most of my workouts, though I didn't keep track of using the elliptical or Wii Fit. So I made another Excel sheet for February and figured I'd keep tracking this month, too, adding in columns for Wii, elliptical, and weight training. The chart really got me thinking, and I have decided on a small personal challenge. Since my highest recorded weight was 345 pounds, I want to try and run 345 miles in 2011. It evens out to 28.75 miles per month, which I think is totally do-able, especially with my preparations for Shamrock Shuffle - in January I logged 29.33 miles, which included my 5k on New Years and a couple of long runs for the 8k race training. What about you? Do you set personal goals/challenges for workouts? Do you do them monthly, seasonally, yearly? I don't really set workout challenges other than timing my 5k walks (still no faster than 48 minutes) or walking for more of a distance. It gives me a sense of accomplishment because the first time I went, I could only walk 3 or 4k and I was much slower. My husband is training for a triathlon, and he is taking adult "master" swim classes - they are meant for people who are training for long-distance swims. You could totally do it!!! I love my charts and graphs, especially the weight tracker, and my training schedule!!! It's awesome to see your hard work tangible in a spreadsheet!!! Wow - you're a rockstar!! I usually set a schedule for working out, but lately I've become a little too obsessed with hot yoga and have been slacking on my weight training - which I guess can't be soooo bad since I lost 2 pounds last week. I fell into a funk earlier this week and haven't worked out yet, but I'm ready to get back into gear. I am starting a running program in March and am super excited!! Ottawa doesn't have many races (which is surprising) but there is a race weekend on May 28-29th, so I'm going to probably sign up for that! Good God you're a beast. That is so awesome! You did amazing!! I love your challenge, you can definitely do it. Infact, if I was a betting man, I'd bet that you will achieve it before the end of the year, especially as you'll continue to improve as the months go by. I don't set exercise goals, I just try to get in a bit more every week. Mine are lifetime goals that get re-evaluated yearly. They're mostly strength related; to bench 1.25x bodyweight, to deadlift 2x bodyweight, and so on. Most important: to be consistent about my training. As usual, you rock!! A tri on the fly! How cool. And great to keep track of the miles! I get a little obsessed with the numbers too, but I try to keep it light and set acheivable goals. I think the idea of a chart like yours is a good one, though. Maybe not every month, but take it one month at a time and see how it goes.